Your bullet-based to-do list can be the ogre that overwhelms you. Or it can be the sprite that nudges you gently. Chronic finishers use them as fuel for productivity, chronic starters play hoops in the trashcan. Then again, you might be someone who doesn’t know where to start when the wizard called “Focus” isn’t around anywhere. May I recommend that you start with the simplest productivity system The Best Productivity Tool Is The One You Actually Use The Best Productivity Tool Is The One You Actually Use In a world chasing productivity, each new and shiny productivity app promises something new. But do we lose something when we change our productivity apps too often? Read More after the human will? The bullet-based to-do list qualifies. These to-do lists can be anything you want it to be. Make a to-do list a lifelong habit. Just call it an “Opportunities List” or a “Just Do It” or “Warp Speed.” Then, get to work striking out the stuff you accomplish. Without action, it is just a bunch of bytes or a piece of paper. Paper works beautifully. But if you belong to the paperless tribe, then consider these bullet-based to-do list apps. Google Tasks isn’t a simple bullet list of events with a checkbox next to them. You can add sub-tasks, include notes, and set due dates with reminders. Try the Google Tasks Chrome extension if you want to keep the bullet list closer to your mouse. Tip: Google Tasks with due dates appear as all-day events in your calendar. Break down a major task into sub-tasks on the list and tackle it one small step at a time. Google Keep is a pure sticky style note app. It is also the simplest of all Google’s tools. But as we have seen before it lets you not only create bulleted lists but also differentiate them with color and collaborate with family or team members. Google Keep can be a creative task management tool 10 Creative Ways to Use Google Keep Every Day 10 Creative Ways to Use Google Keep Every Day Google Keep is a simple note-taking app. But its simplicity hides its usefulness. Here are ten tips and ideas to use Google Keep for the little everyday things in life. Read More beyond a simple bullet list. Just set up the date and location reminders and each note to a task with colors and labels. You can also find them faster this way. Tip: Keep can transcribe text from pictures for you with optical character recognition (OCR). Don’t type notes from a meeting or whiteboard. Snap a picture and create a bullet point list from the transcribed text. Make checklists on the go or sit down for deep research with Apple Notes. It can be found both on Mac and iOS with your iCloud account as the bridge. The “new” Notes app since iOS 11 has gone beyond its earlier dour look. You can still create quick checklists and click the circles to mark items as complete. Or select a paragraph and tap the checklist button to turn it into a list. You can choose from two types of non-numbered checklists or a numbered one. For more interactive checklists you can also attach photos, videos, audio files, website previews, scanned files, drawings, tables, and other items to your notes. Then, lock it all up with a password or Touch ID. Tip: Quickly access notes from the lock screen. Go to Settings > Notes > Access Notes from Lock Screen to activate it. Microsoft didn’t want to be left out, so it bought Wunderlist and made an app to store your to-do’s. The productivity community hasn’t taken kindly to it, but it finds a place in this list because it brings Office 365 integration. Create a bullet list for office or home, personalize it with colorful themes, and add due dates with reminders. Also, try the Intelligent Suggestions feature. Tap the lightbulb and the app suggests to-dos from the day before, what’s due or upcoming. You can access Microsoft To-Do on the web and with apps for iPhone, Android phone, and all Windows 10 devices. Tip: Add an emoji before your list’s name and the emoji will be displayed as the list’s icon in the sidebar. Dynalist is an alternative to Workflowy, the ever popular outliner. You can sidestep the outliner and use the bulleted lists to take on complicated tasks with task folders, due dates, and milestones. Convert any list to a checklist and freely organize multiple items within it at once. It is not completely free, but it has a solid free tier that’s good enough for everyday use with unlimited lists. Do a full comparison with the help of this chart. It’s also a face to face with other bullet list based apps like Workflowy, Checkvist, and Moo.do. Dynalist also has apps for Mac, Android, and iOS. Tip: You can link one bullet point to another with internal links. Checkvist is an outliner and a task manager with a strong preference for hierarchical bullet lists. Keyboard ninjas will love to try out its claim to speed (“the fastest brain dump, ever”). You can create unlimited hierarchical lists and embellish them with notes, tags, due dates, and best of all, markdown support. Checkvist has a Free and a Pro plan. There’s enough meat in the free plan and you just might miss the calendar integration or the due task reminders. Both plans offer browser extensions, bookmarklet, and Gmail integration (add tasks via email). There is no mobile app yet, but you can use the HTML5 mobile web app. Tip: You can combine all list style types in one list. For instance, use [*] for bullets and  for numbers. Taskade is one of the more well-designed to-do list apps. It also works like an outliner as any task can be quickly chopped down into its little parts. If you do most of your work on Chrome, then look up the Taskade Chrome extension. Turn your new tab into a checklist and capture every idea that comes to you. Any bulleted list on Taskade can be shared with anyone on your team. Add #hashtags and @mentions to keep ideas, tasks, and lists organized. Tip: Try the Taskade templates. Momentum is one of the most popular new tab Chrome extensions 12 Gorgeous Chrome New Tab Extensions You've Probably Never Tried 12 Gorgeous Chrome New Tab Extensions You've Probably Never Tried You open a new tab when you have a destination in mind, so your eyes are going to rest on it only for a few seconds. Wouldn't you like the tab to look beautiful? Read More . The tab extension is also available for Firefox. It combines a beautiful wallpaper with a to-do checklist that helps to boost your focus. The Inbox and Today lists help you attack your to-dos from the bottom to the top. The Inbox is your master to-do list. The Today list is for your current to-dos. And, the Done list stores a history of your recently completed todos. Momentum also has a paid Plus version with more personalization options. For instance, you can customize your multiple lists with color and fonts. And also, sync your tasks with Asana, Trello, Todoist, GitHub, Wunderlist, and Google Tasks. Tip: Set up the Balance Mode to hide all widgets and display only your top priority task against the scenic background. Let’s shift to an analog system for bullet to-do lists and journaling. The Bullet Journal has caught our fancy for its simplicity and for the fact that a bullet journal can be anything you want it to be. A simple easy-to-remember system of bullet points turns your journal into a diary, a sketchbook, or a planner. 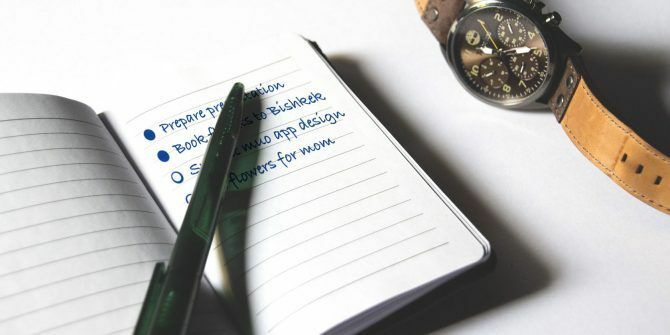 Adopt the basic scheme and you can even turn Evernote into a bullet journal or Trello How to Use a Bullet Journal in Trello to Plan Your Day How to Use a Bullet Journal in Trello to Plan Your Day It's time to show you how to turn Trello -- if that's your primary note-taking app -- into a Bullet Journal. Read More if you want to stick to digital tools. 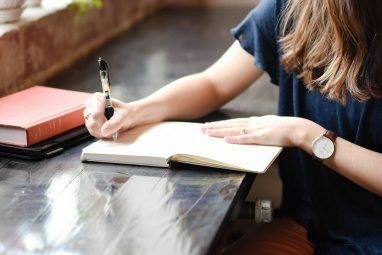 The Bullet Journaling system will help you craft better to-do lists because instead of flat bullet points, you will become more intentional with its planning system. Tip: The Bullet Journal companion app for iOS ($2.99) complements the paper journal. Are You Bullet List Maker? We have taken just a small scoop from the gigantic pile of to-do list apps. 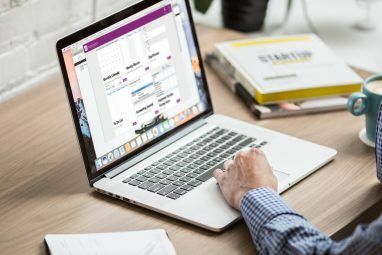 Everything from a simple Notepad file to OneNote can be turned into a place for bulleted to-do lists 8 Super Simple To-Do List Tools to Keep You Focused 8 Super Simple To-Do List Tools to Keep You Focused A to-do list is the simplest productivity system. These eight minimalist to-do list tools are for tracking your daily tasks without the fuss. Read More . They are that simple. 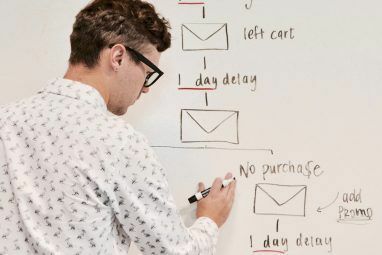 But they can be a bear trap too if you don’t pay attention to the common mistakes we make with our to-do lists 8 To-Do List Mistakes You Must Avoid 8 To-Do List Mistakes You Must Avoid Have you been doing to-do lists wrong all this time? Learn what mistakes to avoid and what you should do instead. Maybe that'll fix your productivity! Read More . The missing deadline is the gravest one. Which is your favorite bullet-based to-do list app? Explore more about: Apple Notes, Bullet Journal, Google Keep, Google Tasks, Microsoft To-Do, Note-Taking Apps, To-Do List.